To see how to shape the plumeria, watch the video at https://youtu.be/x_ehd8QAPnI. Instructions: Card size is 6" x 6". Cut cardstock 12" x 6", score on the long side at 6" and fold to create card base. Cut fun foam 5 7/8" x 5 7/8". Cut the 12" x 12" designer paper with the bungalow scene and use the bottom left 6" x 6" piece. Trim to 5 7/8" x 5 7/8" and adhere to the fun foam with dries clear adhesive and then adhere to card base. Using a sponge and dries clear glue, add various glitters to the entire scene. Diecut the preprinted bungalow, honey pot and honey dipper from the paper collection. Diecut them two more times from black cardstock. Adhere together with dries clear adhesive to form a strong chipboard like element. When the glue has dried, cover them with VersaMark and sprinkle with Ultra Thick Embossing Powder and heat set using the Heat It Tool. Repeat the process one or two more times until desired finish is achieved. Adhere the bungalow, honey pot and honey dipper to the card as shown using dimensional dots. 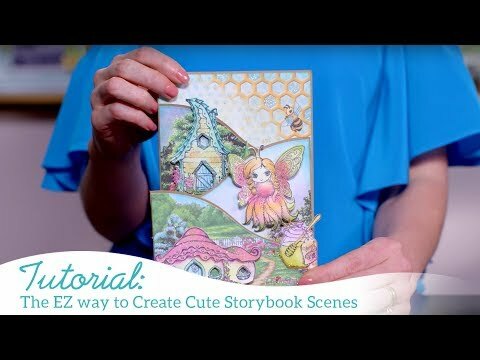 Stamp the honey bees on watercolor cardstock with VersaMark, sprinkle with black embossing powder and heat set using the Heat It tool. Color using the Zig Clean Color Real Brush markers and Kuretake water brush. When dry, use the Quickie glue pen to adhere Lion's Mane glitter to the bees and Crystal Ultrafine Transparent glitter to the wings. Lightly shape using the deluxe flower shaping kit. Adhere to the card as shown using dimensional dots. Stamp the plumeria flowers on pearl white metallic cardstock using Brilliance Pearlescent Jade ink. Color with Pearlescent Jade and Butter inks and diecut using the coordinating die. Watch the video above to see how to shape the plumeria. Add Rajni Chawla's Crystal Clear to the flowers and Aqua Net prills to the centers using dries clear adhesive. Stamp the Sunflower Accent Leaves on white cardstock with Bamboo Leaves ink, color with the same inks and diecut using the coordinating die. Shape using the deluxe Flower Shaping Kit. Sponge with dries clear adhesive and sprinkle with Crystal Ultrafine Transparent Glitter. Adhere the flowers and the leaves to the card as shown using the hot glue gun. Cut the sentiment from the paper collection, mat with black cardstock and adhere with dimensional dots.